Hiding in their temple, the citizens of a Mayan city are hiding from the relentless forces of Ah Min. Escaping through a secret exit they flee to the coast where they commandeer the boats from a small village and set sail to the unknown land beyond just as Ah Min's forces arrive at the beach. Eventually arriving at land (the Southern coast of the modern day USA) the tribe start a new community. Meanwhile a local native tribe lead by Chief Black Eagle (Yul Brynner) discover a canoe washed up and suspect that there might be invaders on their land. While searching they discover the Mayans and Black Eagle is captured. Although the leader of the Mayans, Balam is opposed to human sacrifice, his priest insists that Black Eage should be sacrificed to appease the gods. 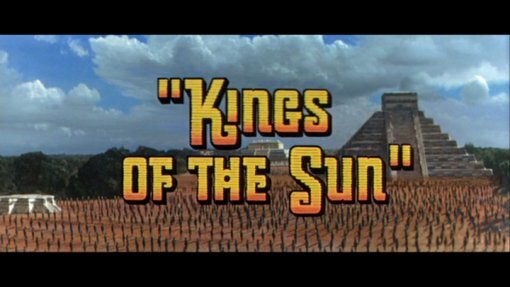 Written by Elliott Arnold during the great heyday of the Hollywood epic, Kings of the Sun is a rather unusual production, largely eschewing battles and action in favour of characterisation and storyline. The main plot is a pretty standard love triangle, but it is played with some unusual conviction and gets a lot more time to develop than in many similar films, making the falling out of the two men over the issue much more understandable. The religious subplot however doesn't get as much time - human sacrifice is a historically controversial issue when it comes to the Mesoamerican tribes and the film approaches it from a rather safe perspective, having the king (and most of the lead characters) opposed to it - we do get a couple of characters expressing their discontent at his attitude but it is largely kept in the background, making a scene near the end where it comes to a potential climax, quite unprepared for in the script. Historically the Mayans almost certainly practiced human sacrific during the period at Chichen Itza, although oddly the film does not mention the known sacrifical location of Sacred Cenote (a small pool), instead giving them Aztec style sacrifical stones atop the temples. The character of Ah Min is based on the real conquering Mayan General Hunac Ceel but the story around him is fictional. After the adventure movie style opening, the film is pretty slow paced as the storyline kicks in and there are no battle scenes until the film's epic climax. While this does avoid the rather gratuitous battle scenes that appeared in some of the other productions, it does mean that the middle of the film will become a little tiresome for action fans. Director J. Lee Thompson had gained epic experience in Taras Bulba and puts it to good use here, particularly in the film's dramatic and genuinely epic scale climax, he also gets to show off some superb direction duirng the dialogue scenes - particularly when Black Eagle is being held in the hut and spends his time lurking inhumanly in the shadows. The Hollywood regular Elmer Bernstein provides the film with a typical epic score but it is not particularly Mayan. Yul Brynner is perfectly cast in the lead role and looks genuinely suitable as a Native American - since he spends most of the film in a loin cloth, he has clearly worked hard on a physique that although impressive, avoids becoming implausible for someone who would hardly have had gym access. West Side Story star George Chakiris seems like rather odd casting as the heroic lead but seems well suited to the part of a young man who is unexpectedly put into power. More at home in the British New Wave, Shirley Anne Field makes a solid choice of female lead. Not as action packed as many of its contemporaries, Kings of the Sun does boast an incredible climactic battle sequence and its midpoint contains some well written storyline. Yul Brynner provides a typically strong performance and the production is on an impressive scale throughout. Certainly one for fans of the 1960s epics and of Yul Brynner. Recommended to fans of the 1960s epics and of Yul Brynner. The print is generally good with only some slight print damage and grain. Other regions? Also available in the US from MGM. An enjoyable epic but rather short on the action scenes. Yul Brynner is as good as ever. Recommended to epic fans. All text in this review written by Timothy Young - 16th October 2008.